This tsunami is the only known example of a New Zealand tsunami generated by a volcano. Run-up for Krakatau Volcano tsunami. The 27 August 1883 explosion of Krakatau Volcano in Indonesia is one example of an eruption-caused tsunami. The eruption generated a 30m tsunami in the Sunda Strait which killed about 36,000 people, as it washed away 165 coastal villages on Java and Sumatra. It also caused atmospheric pressure disturbances, which seem to have excited water waves by transferring energy into the ocean, resulting in sea level disturbances being recorded on tide gauges at locations more than 7,000 km from the source. 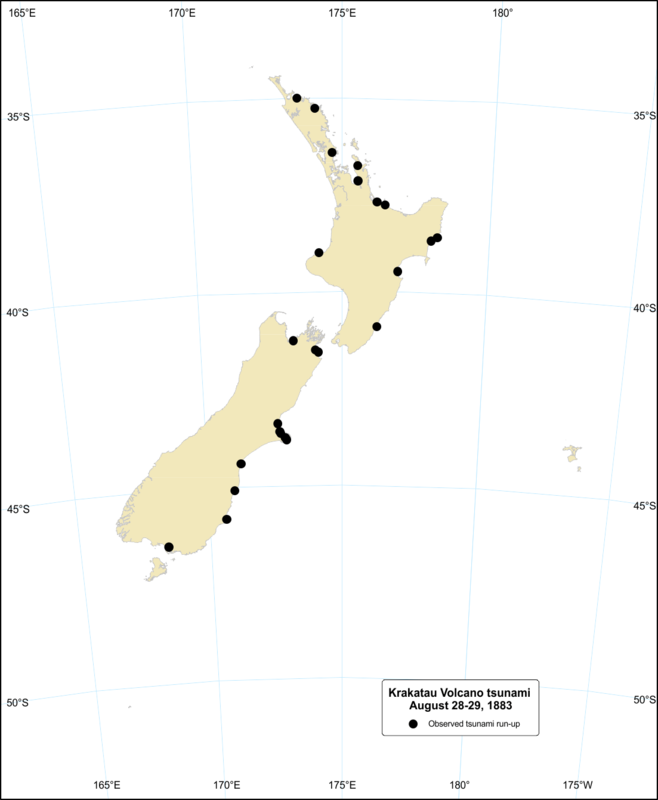 In New Zealand, the tsunami was observed at many locations around the country, and was first noticed late in the evening of 28 August (at Mangonui, Lyttelton and Port Chalmers) about 29-30 hours after the eruption took place. Many locations, however, did not notice any surges until the next morning, when the surges probably reached their maximum at most places. Several places reported continuance of oscillations for more than 24 hours. The places that were most affected by surges were mainly the eastern seaboard from Mangonui (in Northland) to Port Chalmers (in the South Island). The height of the waves above sea level at the time was mostly less than 1.2m. The locations where the waves were (reliably) more than 1m are Mangonui, Warkworth (i.e. Mahurangi estuary), the upper reaches of Waitemata harbour, eastern side of the Coromandel Peninsula, Whangara (north of Gisborne), locations on Banks Peninsula, and Oamaru. These are some of the largest effects recorded worldwide outside the zone not affected by the tsunami directly generated by the eruption/explosion.